We have used water purification pumps for years and years. On short backpacking trips in the southern Appalachians, we often did not carry a pump, simply because we knew where to find spring water. But in a lot of cases outside the Great Smoky Mtns Nat’l Park, it was tough to find springs that had not been messed up by cattle grazing or wildlife. And of course, out west, it was nigh on impossible, or close to it anyway, to find water that did not have to be treated. Water purification pumps were not light (usually weighing a pound or so). But they provided water that lacked the iodine treated taste, and made things more palatable. On the next to last night of our Upper Paria/Upper Hackberry Canyon trip in 2008, our handle on our Pur Hiker pump broke (plastic will eventually do that if it is used a lot) and had it not been for our friends' pump, those iodine tablets would have gotten a lot of work out. So with a good-sized REI dividend that year, it seemed to be a good idea to try some newer technology: micro-scale UV treatment systems. I had recalled sitting on an EPA Advisory Panel where these systems had been discussed for small communities, and it seemed that the idea behind the basic concept was pretty sound. So I purchased one of the Steri-Pen Classic systems. Essentially, these units use batteries to generate ultra-violet light from a small tube that is placed into a water bottle full of water you want to treat. You turn on the light, it stays on for about 90 seconds, and bingo, you have a liter of potable water. No more waiting an hour (or more, depending on the water temperature) for the iodine tablets to work. Now, understand that the UV light does not kill the bacteria or viruses in the water. Rather, it messes up (a highly technical term – sorry) their DNA, so that they cannot reproduce. Hey, as long as the bacteria don’t grow in my stomach or intestines, I am a happy camper, literally. Now, the Steripen Classic does use batteries, but on a full load of lithium batteries, it should be able to treat about 100 liters of water. Such should be plenty for two people for a week long trip, given that one would likely be boiling other water for cooking. I recall the first time I used the Classic, I was fairly impressed. 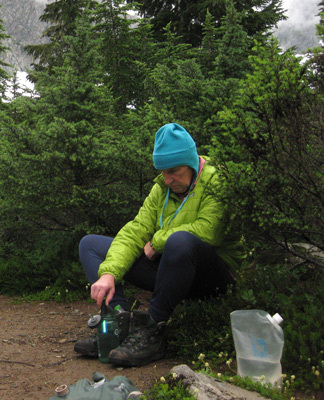 Usually, on day hikes, I can carry sufficient water for the day, but this ended up being a warm hike, and frankly, the Steripen was much lighter than a pump, so it is easier to slip into your day pack. I used it on the rest of our short backpacking trips that fall, and it seemed to work pretty well. But when we went out for a week in the spring of 2009, the Steri-pen started giving me problems. After a few days, it kept giving me error messages, in themode of a flashing red LED. Without the light being green, you ain’t “good to go”. It would flash green, and then when I stuck it into the water to be treated, it would start flashing red, indicating it was not in any water. Thus, the UV lamp would not turn on. What a pain. I continued to use the Steripen on shorter trips, or dry it out thoroughly on layover days, and that sorta helped, a bit. 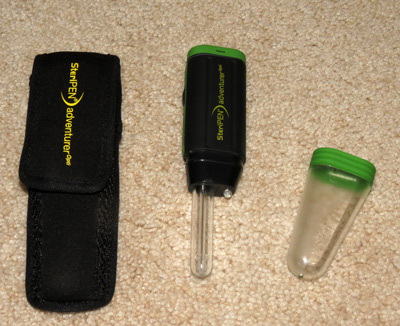 By this time, many of our hiking buddies had purchased Steri-pens, and theirs were working great. But they were using a different model, the Steripen Adventure. It is a bit smaller and a bit lighter weight. They seemed to have no problems. So eventually, I succumbed and bought the Steripen Adventure model. (See photo above.) What can I say? It just works. In 2012, we took it on a warm (thus, we needed to drink a lot of water) 8 day canyon trip in the Escalante system. It never gave an error code, it just always functioned as it should. The weight is 4.5 oz, including batteries (it uses two Lithium CR123’s, which may be a bit harder to find than lithium AA cells), protective cover for the lamp, and carrying case. But here is the real question: does it function as it should and prevent bacteria from multiplying? Well, I ain’t no Consumer Reports, but I do believe in field testing. This, I think was the ultimate field test. On the aforementioned canyon trip, we were coming up Harris wash, and spent our last night about 3.7 miles from the trail head. (We had to walk a long way on the car shuttle, so we wanted to keep our morning short.) There was plenty of water flowing past the campsite, and it looked as pure as the driven snow. Nevertheless, all of us had Steripens and all of us faithfully treated the water. The next morning, as Andy and I were hiking out, we started to notice more and more signs of cows, like this and this . Hiking in the last mile or two of Harris Wash felt – and smelled – like walking thru a feedlot. I recall saying to Andy: “This will be a great test of the Steripen.” And yes it was and yes, the Steripen passed with flying colors. No one, despite drinking water laced with cow crap, etc etc, not sick. That, to me, is the ultimate test. So since that time, I have become a big fan of the Steripen Adventure. (Photo to the right is me using it on a short backpack in the Mt. Baker Wilderness in August 2013.) We even take it for overseas hiking trips. The best 4.5 oz I have ever carried.